Produktinformationen "DC MULTIVERSE WONDER WOMAN MOVIE 30cm ACTIONFIGUR"
Celebrate Wonder Woman and her thrilling new movie with this 12" collector action figure! She features 12 points of articulation, highly detailed sculpted head and hair, iconic outfit with eagle encrusted breastplate, headdress with starburst, and includes her infamous sword and flexible Lasso accessories! Recreate authentic movie adventures or add this unique figure to your DC collection. For the adult collector. NICHT GEEIGNET FÜR KINDER UNTER 3 JAHRE ! 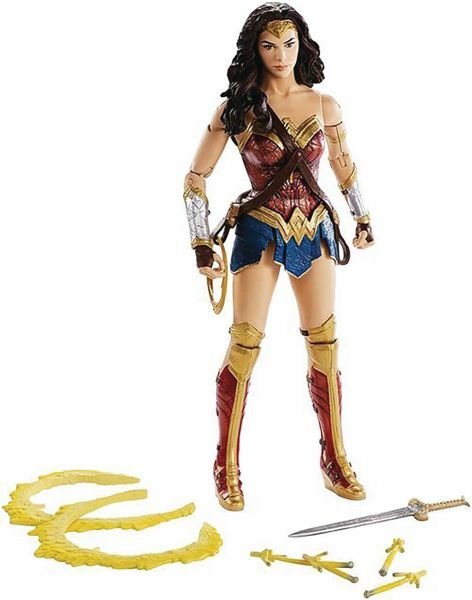 Weiterführende Links zu "DC MULTIVERSE WONDER WOMAN MOVIE 30cm ACTIONFIGUR"
Kundenbewertungen für "DC MULTIVERSE WONDER WOMAN MOVIE 30cm ACTIONFIGUR"